Booking a Birthday Bash is a piece of cake! Let The Clay Center handle set up, clean up and the action-packed FUN! All that’s left to do is blow out the candles. 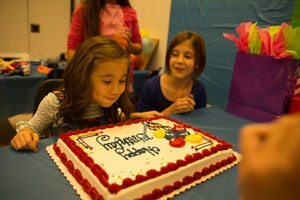 Clay Center Family Plus and Premium Plus Members enjoy a 20% discount on our Classic and Deluxe Birthday Bash packages! The CLASSIC Birthday Bash features everything you need for a stress free celebration! The PREMIUM Birthday Bash allows you and 50 of your closest friends to take over the entire museum for a 2 hour private party! This option is not limited to birthdays! Celebrate a team victory, reward your class on a job well done or choose any reason to party with the Museum galleries all to yourself! Limited availability, a representative from The Clay Center will contact you concerning scheduling options. Hands-on activities led by a Discovery Leader! 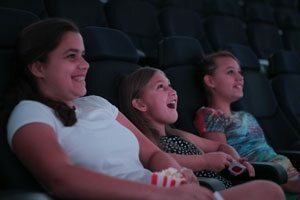 You and your guests will enjoy an out of this world Bday Bash in our newly renovated Caperton Planetarium and Classroom! Party guests will blast into space with our exciting new Planetarium Show! You bring the cake, we’ve got the ice cream covered! Using liquid nitrogen and sweet cream, one of our talented Discovery Leaders will create homemade ice cream right before your eyes! Welcome to the WONDROUS WORLD OF WATER!!!! The most abundant natural resource on the planet, it makes up 71% of the Earth’s surface, without it, we’d all perish! Luckily, we have plenty of water here in WV and here at the Clay Center. So much so, that we’re going to share the wacky, weirdo and wondrous things that water can do! 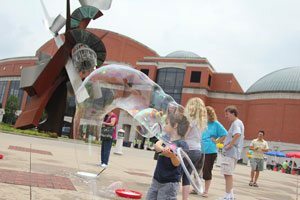 Let us be your guide through crazy experiments before we head out to Water Works to explore the great big world of water! Participate in 3 wacky water experiments like Water & Fire, Rising water secret & Mysterious Water Suspension led by one of our trained discovery leaders and an interactive scavenger hunt throughout our newest Water Works exhibit!